Brain Wave captures the JSA but remains unseen when the All-Star Squadron arrives on the scene. From All-Star Squadron #19 (1983); art by Jerry Ordway. How Brain Wave survived his first encounter with the JSA. From All-Star Comics #17 (1943); art by Joe Gallagher. The founding members of the Injustice Society. Clockwise from Brain Wave: the Gambler, Vandal Savage, the Wizard, Per Degaton, and the Thinker. From All-Star Comics #37 (1947); art by Irwin Hasen. Brain Wave's new look. From All-Star Comics #59 (1976); art by Ric Estrada and Wally Wood. Early in 1942, Dr. King set his grand plot in motion. He attacked the JSA unseen, triggering his posthypnotic suggestion and trapping them inside the Perisphere on the grounds of the New York World's Fair. The Brain Wave used his mental powers to broadcast a hallucination that the heroes were going into war with Japan, only to be slain in battle. (All-Star Comics #11, All-Star Squadron #19) The captive All-Stars were rescued by Green Lantern, who managed to shake his own terrifying vision. The feedback from it destroyed the machinery that had enhanced Brain Wave's abilities. (All-Star Squadron #20) NOTES: The events of All-Star Comics #11 were not originally presented as a dream; it was explained as such in All-Star Squadron #19. The father passes his gifts—and his madness?—on to his son. From Infinity, Inc. #10 (1985); art by Jerry Ordway. Brainwave's Legion of Doom. From Extreme Justice #18 (1996); art by Tom Morgan and Ken Branch. Clues that there's something amiss with Brainwave. 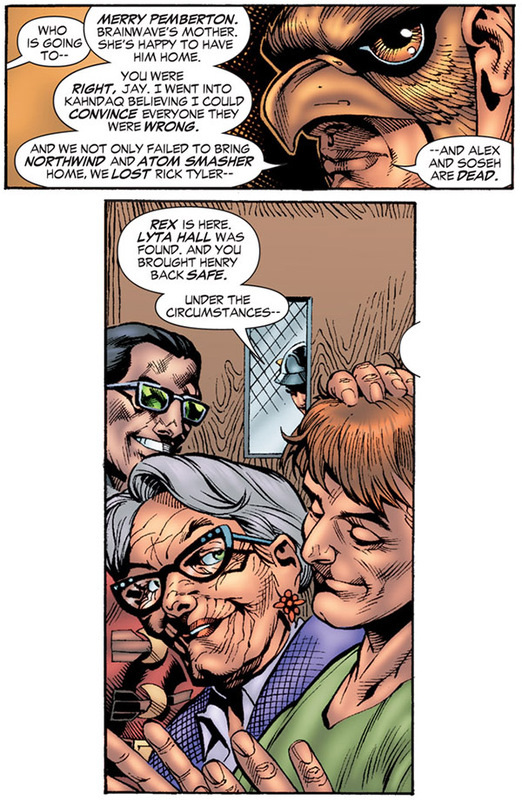 From JSA #57 (2004); art by Don Kramer and Keith Champagne. Merry is reunited with her son, Hank. From Hawkman v.4 #18 (2004); art by Rags Morales and Michael Bair. Hank King in Parador. From JSA All-Stars #9 (2010); art by Freddie Williams II. The original Brain Wave was more of a powerful illusionist than a full-strength telepath. His mental abilities allowed him limited control over people's thoughts and actions. What made him more formidable was the fact that his powers also enhanced his human intellect. He was a first rate inventor and used his inventions to nefarious ends. Brainwave II was born with his father's mental skills. He could read minds and also had telekinesis that allowed him to fly. When his father died, he inherited all the elder's knowledge and some of his powers. This made Brainwave II an even more powerful telepath.